If you are in need of 24/7 Macomb County Water Damage Restoration services, please contact Duo-Care Cleaning and Restoration at (586) 263-9930 now! Click here to learn more about our water damage restoration services or read our excellent reviews on Google! You find your home or business under water after a storm or flood. Instinctively you try to get rid of the water and clean the affected area. How bad could the damage be, its just water? Do I need to call a professional flood damage restoration company? Why can’t I clean it myself? 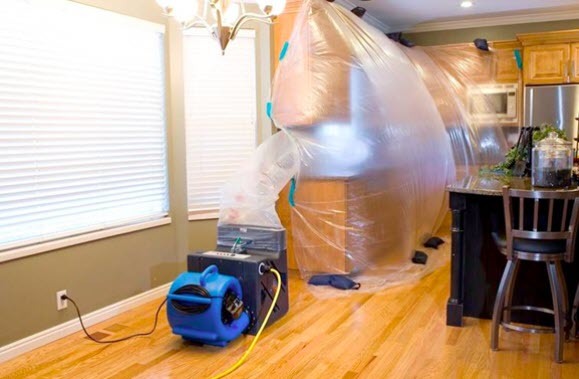 When there’s water damage in your home that’s caused by a flood, it is extremely important to call the experts to properly clean and restore the area, especially if it has been exposed to flood waters for more than 24 hours. Calling an expert can significantly reduce damages, prevent long-term problems and protect your health. Your health is important to us. Floodwaters are known for carrying bacteria and other hazardous organisms such as viruses and pests. These contaminated waters can seriously affect your home and increase the chance of mold and mildew growth. Coming in contact with the affected area or water can also put you or your family at risk for developing health problems. After a flood, the clock is running to quickly restore your home. In just a matter of 24 hours, your home or business can sustain costly long-term water damage and mold and mildew will begin to grow. Flood damage restoration companies have the equipment, expertise, and manpower to clean up, repair and restore your home quickly and efficiently. Our technicians will also remove bacterial threats, mold and hazardous material from your home, so your family can return with no health. Flood restoration work is not for your typical do-it-yourselfers. Without the correct equipment or experience, cleaning the affected area yourself can leave you with more flood damage problems than you had before. Determining if your wet drywall, carpet or furniture and appliances can be salvaged or needs replacing requires a professional opinion. Industrial equipment is also required for any standing water that is more than an inch deep. Reduce Your Losses and Save Money! For most people, restoration and repair costs are the main reasons for not calling a professional. It is often believed that you could save money by cleaning the affected area on your own. Contrary to this belief, hiring a flood damage restoration company immediately after a flood damage situation can drastically reduce your losses and costs. The sooner the water is extracted and the area is dried, the less damage your home will be prone to. Timely responses can save your home or business from structural damage, floor and wall damage, mold, and furniture damage. Many flood restoration companies will work with your insurance company and even handle the claiming process for you. Restoration professionals can aid in documenting your losses and assessing damages to ensure that you get a fair settlement. Hiring a flood damage restoration professional helps reduce the stress after a flood has taken place. The restoration process takes a lot of time, work, and energy. For top rated Macomb County Flood Damage Restoration services, please call Duo-Care Cleaning and Restoration at (586) 263-9930. This entry was posted in Macomb County Flood Damage Restoration and tagged Macomb County Flood Damage Restoration, Macomb County Flood Service, Macomb County Water Emergency Service, Macomb County Water Extraction on January 28, 2019 by Duo-Care.